I don’t care what anyone says. Flowers have power! They have the power to say “I’m sorry,” “I’m thinking of you” and “I love you.” But my favorite flowers … and the ones I think have the most power … are the “just because” flowers. Those flowers instantly light up my day. And it just so happens that I got those “Just Because” flowers today from PoppaNut. Delivered to my work, the flowers arrived just after lunch. I got a note to come to the front desk for a package. Well, I had ordered something off eBay (more to come on that later), and I thought it was that. 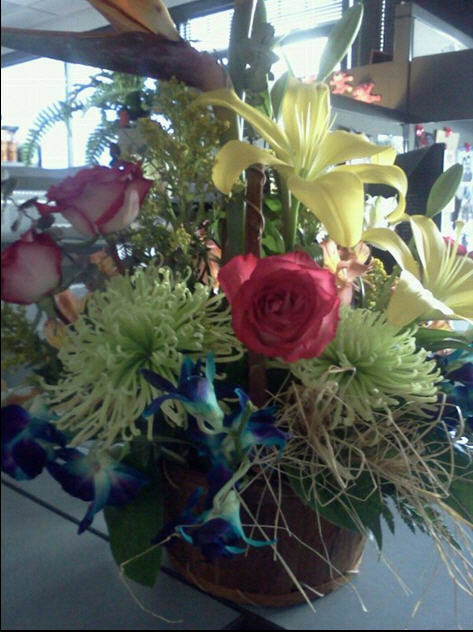 What a beautiful surprise to see these flowers waiting for me instead … with the most beautiful note in the whole world. PoppaNut has always sent me flowers for no reason at all (This is where I insert my biggest thanks in the whole world to PoppaNut’s mom and sisters for raising the most wonderful man in the whole world!). It’s the sweetest thing in the whole world, and I know he doesn’t do it to be recognized or anything like that. He does it just to make me smile, to remind me that after nearly three years together, he still loves me more than anything in the world. And what could be better than that. I can’t think of a single thing. And that’s life in a nutshell … remind the one you love that you love them and why! I love you, PoppaNut.